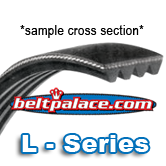 615L10 POLY-V Belt (Micro V) L Section. 61.5" Length, 10 Ribs (1-7/8" Wide). 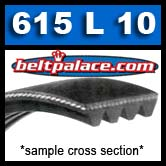 Heavy Duty 615L10 Belt for applications such as appliances, outdoor power equipment, roller conveyors, machine tools, medical equipment and exercise equipment.